2018 was a bumper year of parliamentary business. With the year done and dusted, we review some of the legislature’s activities and highlights from this period. The Fifth Parliament has given us a lot of “firsts”. Another such milestone was achieved early in February when the Legislature postponed the State of the Nation Address (SONA). Even by this Parliament’s unpredictable standards, this was an extraordinary decision. The stated rationale for the postponement was to “create room for establishing a much more conducive political environment in Parliament”. In reality, Parliament was in limbo and a bystander as internal party politics (the ANC negotiating the exit of the President) seemingly usurped parliamentary processes. To jog your memory by way of timeline: SONA was supposed to take place on 8 February but the event was postponed on 6 February. President Zuma resigned late evening on 14 February. The following day, Parliament held a special sitting to elect a new President. On Friday 16 February, President Ramaphosa delivered the State of the Nation Address. This change brought about a noticeable shift in Parliament’s (read opposition lawmakers) interaction with the President. The former President’s appearances were characterised by rancour, noise and even violence. This has dissipated. It’s a fact that land is a highly divisive and emotional issue in South Africa. People have strong views on the topic. It was therefore inevitable that any proposal dealing with property rights would cause a political tremor and eclipse everything else. In February 2018, the Joint Constitutional Review Committee was mandated by the National Assembly and the National Council of Provinces to investigate mechanisms through which land can be expropriated without compensation. This set in motion a process that resulted in unprecedented levels of interest and submissions. 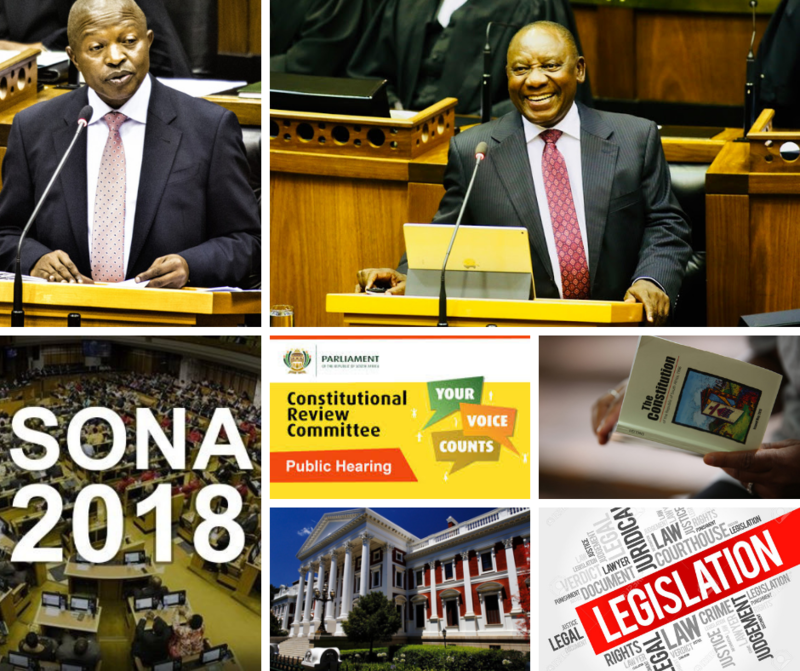 Public hearings –spread out across all 9 provinces - were often packed to capacity as South Africans from all walks of lives participated in the process. At times Parliament was overwhelmed and battled to cope with the 630 000 written submissions. It even hired an outside service provider to help but this brought its own challenges and complications. As expected, there was no unanimity on this and ultimately the majority view prevailed, which recommended that Section 25 of the Constitution be amended to make it explicitly clear that expropriation of land without compensation by the state in the public interest should be one mechanism to address the injustices of the past. Before the report could be considered by both Houses, the first legal challenge was mounted by Afriforum. This application was viewed as premature and dismissed by the Western Cape High Court. Now that the report has been adopted by both chambers, others (the DA has raised questions about procedural flaws) are queuing up to take the legal route to halt the pending constitutional amendment. Process wise, there is still a lot more to be done though. A Constitutional Amendment Bill – to give effect to the report – has to be introduced in the National Assembly. Before introduction, the draft bill has to be gazetted for 30 days to allow for public comment. Upon introduction, the bill will be subjected to the normal scrutiny and public participation process. Because the bill will seek to amend a section of the Bill of Rights, at least two thirds of National Assembly members must support it. The National Council of Provinces can only pass such a bill if at least six provinces support it. At its last sitting for the year, the National Assembly established an Ad Hoc Committee to initiate and introduce a Constitutional Amendment and report back to the National Assembly by 31 March 2019. The ANC concedes that the deadline is ambitious but if it is not completed it wants a progress report from the Ad Hoc Committee. On the same day, another important piece of the puzzle was added: Cabinet approved publication of the Revised Expropriation Bill for public comment. The revised bill will give expression to the amendment by providing explicit circumstances under which land expropriation in the public interest may be done without compensation. 2018 was a big legislative year. Parliament passed 23 bills and considered dozens more. This is unsurprising as the legislative output in a pre-election year typically surpasses any other normal year. This is as a result of dealing with the backlog that has accumulated over time as well as the pressure from the government to finalise its legislative agenda before the elections. 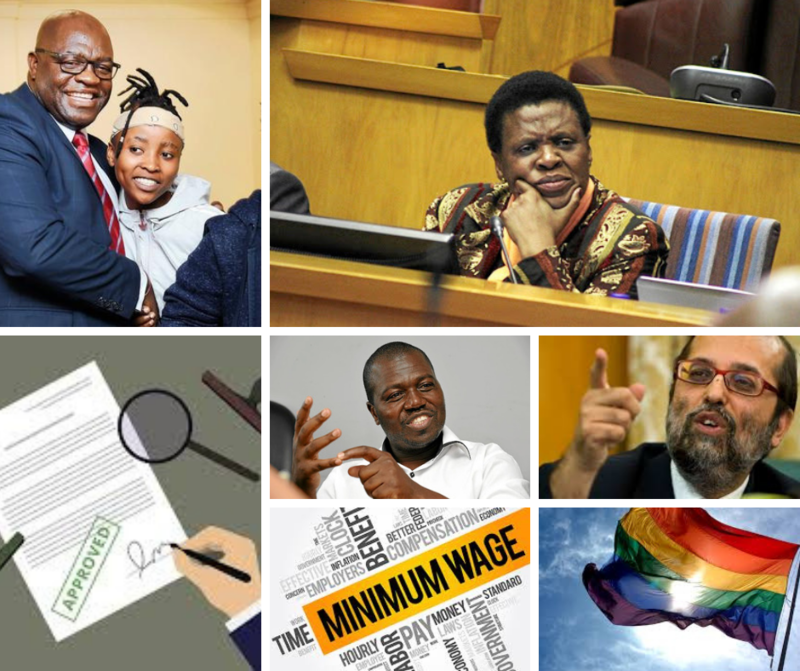 Amongst the bills passed were a trio of labour bills - Labour Relations Amendment Bill, Basic Conditions of Employment Amendment Bill and the National Minimum Wage Bill – as well as the Public Audit Amendment Bill, Political Party Funding Bill and Competition Amendment Bill. The passage of several bills – which are still in the legislative pipeline – like the National Credit Amendment Bill, Road Accident Benefit Schemes Amendment Bill, Cybercrimes and CyberSecurity Bill, Customary Initiation and Copyright Amendment Bill - was fraught and sparked a lot of debate. There are currently 62 bills in the highways and byways of both Houses. The majority of these unfinished Bills are expected to be finalised in early 2019. There was an uptick in Private Members’ Bill introduced this year (11). Whatever the motivation and merit of their legislative proposals, MPs exercised their right and as a result 2018 saw the largest number of bills introduced by individual MPs in a single year. Generally, these sorts of bills face a tough hurdle as they are – in the main - introduced by opposition lawmakers who are trying to convince a government that it has to implement a law that it did not decide to introduce. That said, there have been some noteworthy victories. The Labour Laws Amendment Bill was passed and signed into law. The Civil Union Amendment Bill appears on track to achieve the same but the controversial Choice on Termination of Pregnancy Amendment Bill was rejected. get a chance to work on this so this task will be handed over to the Sixth Parliament as a legacy item. In mid-2017, the Portfolio Committees on Home Affairs, Mineral Resources, Public Enterprises and Transport were directed to investigate accusations of state capture involving Ministers. While no specific deadline was set for the outcome of these investigations, the committees were urged to begin with the work and report their recommendations to the House urgently. Fast forward 18 months and the progress is mixed. The committees stalled for long periods for a variety of reasons: this includes prioritising other parliamentary business, delays by the House Chairperson and Speaker to provide funding, difficulty in securing the attendance of witnesses and being mired in process debates etc.. The Public Enterprises Committee – tasked with exposing the rot at Eskom – was the first committee to kick start the inquiries and incidentally the first to report back to the House. The Committee worked tirelessly, had many late nights and demonstrated what cross-party cooperation can achieve. The Home Affairs Committee – looking into the Gupta naturalisation – has made substantial progress with its inquiry while the other two committees (Mineral Resources and Transport) have barely got off the ground. Maybe it’s because there is a Judicial Commission of Inquiry investigating state capture, but whatever pressure or urgency there was on these committees (if any existed in the first place), it now seems absent. All four Committees are cooperating with the Judicial Commission of Inquiry and Parliament has handed over meeting transcripts and documentation to this body. There were also mixed results with two other parliamentary inquiries. First, the Portfolio Committee on Trade and Industry resolved last year to conduct an inquiry into Transnet’s compliance with its local public procurement policy. The Committee cited a busy schedule for not pursuing the inquiry but indicated that this will be followed through in the new year. Second, there was supposed to be joint inquiry by the Portfolio Committee on Water and Sanitation, SCOPA and the Portfolio Committee on Public Service and Administration into the functioning of the Department of Water and Sanitation. The joint committee was meant to focus on human resources management, infrastructure projects, contract management and project management, implementing agents, ministerial directives to water boards, investigations, raw water revenue, governance of the water entities and reconfiguration of the Department. Due to the workload of the other committees, SCOPA decided to conduct the inquiry on its own. The mandate of the HLP was to review the impact of post-1994 legislation in accelerating change and transformation. As part of this work, the Panel identified gaps, laws that need strengthening and made recommendations. Parliament published the Panel’s report in 2017. In 2018 a committee was set up to look at the Report and refer its recommendations to the relevant committees to respond to, in particular what legislative interventions they would make. It was agreed that the report and the recommendations would form part of Parliament’s legacy report. At one of the Joint Rules meetings it was noted that the High Level Panel report was an excellent document that can guide Parliament and Committees and the body of knowledge, information and the public participation that went into it should not be wasted. It is curious though why this report was ignored by the Joint Constitutional Review Committee and the Panel not invited to make an oral submission. Committees remain a vital platform where the real work of Parliament takes place. They provide lawmakers a unique opportunity to hear directly from experts, organisations and citizens who are interested in or affected by a particular issue. It also affords them more time to fully examine a topic and they are not held back by the constraints affecting plenary sittings. More than 1 400 Committee meetings were held this year. Committees dealt with important topics including food security, municipal debt, listeriosis, corruption, draft Integrated Resource Plan and canned hunting to name a few. The Standing Committee on Public Accounts (SCOPA) sat more than 40 times and has been at the forefront of tackling wayward SOEs and departments – think SASSA, SABC, SAA, Water & Sanitation. SCOPA Members are refreshingly unified in pursuit of making institutions account for wasteful or irregular expenditure from the public purse. Apart from its legislative commitments, the Standing Committee on Finance had a full plate dealing with Steinhoff, VBS, illicit tobacco and the 1% VAT increase. In terms of volume of meetings, no one comes close to the Trade and Industry Committee, which was primarily occupied with multiple pieces of important and complex legislation. The National Assembly’s passing of the National Credit Amendment Bill (debt relief bill) was a major achievement as a complex Committee-drafted bill that was started in 2016. This year there have also been a number of disruptions of Committee meetings - in May, an economic transformation meeting descended into chaos after guest speaker and BLF leader, Andile Mngxitama, was kicked out for calling the Chairperson of the Trade and Industry Portfolio Committee, Joan Fubbs, a fascist. The Chairperson of Finance, Yunus Carrim, took exception to this and insisted that BLF leaves. A confrontation then ensued. Later in May, a Labour Portfolio Committee meeting on the national minimum wage was disrupted by alleged SAFTU activists. In October, BLF members were forcefully ejected after disrupting a Home Affairs Portfolio Committee meeting with the Oppenheimers on the Fireblade Aviation private terminal at OR Tambo International Airport. All three incidents were raised with Parliament's executive - while the Constitution and Rules of Parliament are clear that members of the public are free to observe meetings, they are barred from participating and impeding the work of the Committee. There was talk of laying charges but it's unclear how such matters are to be handled in future. Side note: Civil society organisations wrote to the Speaker to voice concern about the number of closed or partially closed meetings in 2018. There was one particularly bad incident where the parliamentary protection services barred the media from attending a Water and Sanitation committee meeting. This action was condemned by the ANC chief whip. With the elections looming large in 2019, MPs used every possible parliamentary occasion - question time, Members’ statements, debates, whatever – to target hot button election issues in scoring points over their opponents. Debates in the main chambers were often passionate and covered an array of topics such as state capture, the relationship between Parliament and the Executive, the functioning of government departments, the economy and jobs, land, the fuel price, the performance of municipalities and state owned companies, the living conditions of farm workers and nationalisation of banks. Members of the Executive, including the President and the Deputy President, availed themselves routinely to answer Oral Questions in both the National Assembly and NCOP. That said, truancy by some Ministers remained a constant concern despite repeated demands to address this. The opposition were critical of the Executive for missing Question Time. Committees were also often frustrated when Ministers or their Deputies fail to pitch up for key meetings. Last year, assurances were made that those who miss scheduled Committee and plenary sittings can be sanctioned but there has been little evidence of this. Following a 2017 resolution, the Leader of Government Business provides Parliament with regular updates on outstanding written questions. There was a spike in MP attendance at Committee meetings in the final year of the Fifth Parliament, with most achieving double digit increases in attendance. The best attended Committees according to PMG data are: SCOPA, Police and Transport. Parliament’s role includes recommending to the President the appointment of certain office bearers. 2018 was relatively quiet in this regard as most of this work has been deferred to next year. This year, Parliament recommended three individuals to the President for appointment as commissioners to the Independent Electoral Commission. The Portfolio Committee on Communications re-started the process of appointing new board members for the MDDA. An Ad hoc Committee advertised for Commissioners to serve in the Commission for Gender Equality as Commissioners. The Portfolio Committee on Arts and Culture interviewed candidates for appointment to the Pan South African Language Board (PanSALB). There appears to be a departure from the benchmark that was set in 2016 for transparency and greater public involvement. This year, only names, not CVs, have been published for the public to comment on and in the case of Pansalb the public was asked to comment on the candidates during the course of the interviews – instead of before – and given a reduced time to comment. If you are keeping score, Parliament had some success and failures in the courts this year. The Western Cape High Court upheld Parliament’s right to discipline the Economic Freedom Fighters (EFF) for disrupting a sitting of the National Assembly in 2014. Public participation – or the lack thereof - seems to be the Legislature’s Achilles heel yet again. In South African Veterinary Association vs Speaker of National Assembly and others, the Constitutional Court ruled that both the National Assembly and the National council of Provinces failed to facilitate meaningful public involvement on the insertion of the word “veterinarian” into the Medicines and Related Substances Act. Parliament successfully defended AfriForum’s application to prevent it from considering the report of the Joint Constitutional Review Committee. Labour relations: Parliament learned that in the past few years, many professional staff members were reported to have resigned. Reasons advanced for this were the five year fixed-term contracts, expensive accommodation in Cape Town, and an unpleasant work environment. A parliamentary section manager also committed suicide on the precinct. This sparked inquiries about the security arrangements in Parliament and staff working conditions. Parliament published the 2017 Register of Members’ Interest. According to the legislature, all Members who were legally obliged to disclose did so; however, there was concern about the growing number of late disclosures. 10 October 2018 was designated as the deadline for disclosures in 2018. It’s unclear when this will be published but the Joint Committee resolved to accept all disclosures submitted after the deadline. The NCOP's Taking Parliament to the People took place in Gauteng this year. In the preceding years, the Free State, Eastern Cape and Western Cape were the selected provinces. The programme is conducted in three legs: the pre-visits earlier in the year, the main event and a report-back session (a year later) to follow-up on commitments made. The new Parliament will be expected to do the follow up. Parliament passed rules to remove a president from office in terms of section 89 of the Constitution to give effect to a Constitutional Court judgement. Parliament has published its First Term 2019 Programme. There is still a lot of urgent business outstanding. A major project is Parliament’s Legacy Report. This document will give a critical assessment of the institution’s performance over the past five years as well as make recommendations to the Sixth Parliament.